40 comments - Post a response! 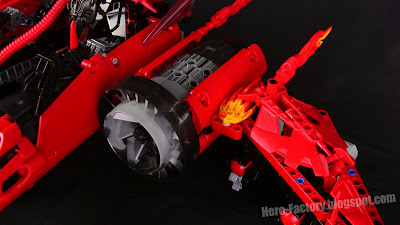 LEGO Hero Factory MOC: Maelstrom + Gunship "Fire Storm"
Right, back to the Hero Factory MOCs I go! 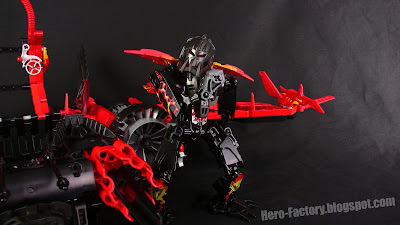 This is my first 2011 series villain MOC, or should I say MOCs. Paired together, the gunship Fire Storm and its pilot, Maelstrom, make the most wrecklessly destructive force in Fire Storm's private army. 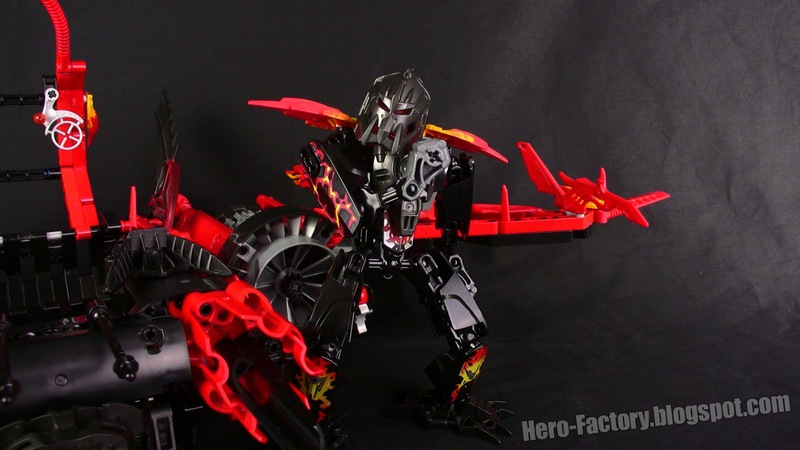 Little is known about Maelstrom, but he is believed to be the personal apprentice of the Fire Lord. Next in the line of succession, should Fire Lord fall? What we do know is that he has no concern or caring for life or property, other than his own, and he uses all of the current villains' unique armor pieces. 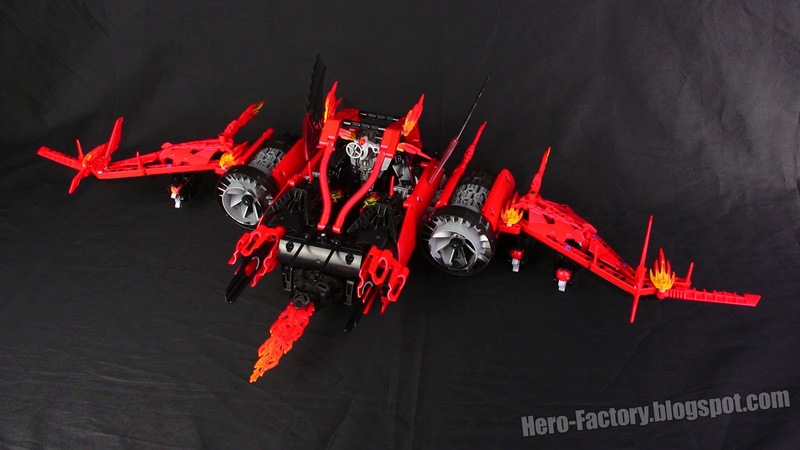 The gunship Fire Storm features two lava sphere cannons under each wing, plus a forward-facing flame thrower. Power comes from two giant turbofan engines. These engines guzzle so much fuel that the entire frame of the whole craft is used for fuel storage. Small cracks in the frame have developed over time from high-G maneuvers and these leak small amounts of jet fuel. When the engines come to life, these fuel leaks ignite, causing the whole craft to appear to be on fire as it streaks through the sky like a phoenix. 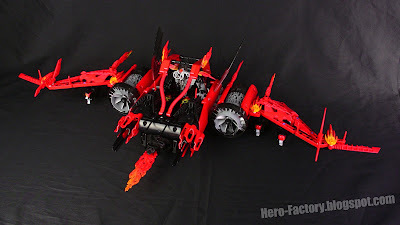 Video: LEGO Hero Factory MOC: Maelstrom & the Gunship "Fire Storm"
At this year's Nuremberg Toy Fair, Lego began teasing out the summer 2011 Hero Factory releases by showing an apparently complete (and delightfully massive) Witch Doctor, golden Rocka 3.0, and a Stringer 3.0 & Nex 3.0 combiner model. Note that the green color for the hero unique armor pieces has unfortunately been preserved from the early leaked photos, though in translucent form. Credit to the site Spieletest.at for the photo.